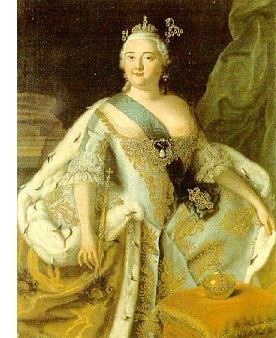 Catherine the Great (1729-1796) - The most well-known and longest reigning (from 1762-1796) Czarina in Russian history. It's widely accepted that she conspired to have her husband, Peter III, murdered. She certainly had him overthrown in a coup only six months after he became Czar; and shortly after his arrest, he was strangled by his prison guards. Whether or not she was behind his death is unclear. Peter was quite unpopular due to his support for Prussia. Like her husband, Catherine was German, born in Pomerania, Prussia. Unlike her husband, she embraced the Russian lifestyle and culture in a way Peter did not. While he was an admirer of Frederick the Great, Catherine was an admirer of Peter the Great. This made her a more popular ruler than her husband. Of course, she never would have had the ability to overthrow the sitting Czar without help from some powerful people. Two in particular. Grigory Orlov who was her lover and led the coup; and Grigory Potemkin, who was a trusted aid and military leader. Once in power, Catherine proved herself to be a powerful ruler. The expansion of the Russian Empire is perhaps her greatest legacy. She pushed the nation's borders westward and southward, and it was during her reign that Russia claimed Alaska as part of its empire. It had already sent explorers to the region during the time of Peter the Great; but by Catherine's reign, other European countries were encroaching on the land, and she wanted to make it clear that it belonged to Russia (Alaska was sold, of course, to the United States in 1867). Among her most important foreign policies events were Russia's two wars with the Ottoman Empire, known as the Russo-Turkish Wars. These wars allowed Catherine to accomplish what Peter the Great failed to do; push the Ottomans back from the northern Black Sea region. Russia acquired Crimea and the Empress put her stamp on the region by founding the city of Odessa. Also, in keeping with Peter the Great's policies, Catherine tried to strengthen ties with Western Europe. She approved an economic treaty with Great Britain in 1766. However, militarily she was wary of England, particularly after the country's victory in the Seven Years' War. All in all, though, by the end of her reign, she elevated Russia's status to that of world power, on par with the other great nations of Europe.